Most commonly used to display a Photo Montage, 1-800-Jam-Music will provide up to 4x 50” flat-screens utilizing the latest LED technology. You will have the choice of mounting the TVs on a Crank-Up Stand which is ideal when you have a larger crowd so the TVs can be lifted high enough that everyone can see or you can have them mounted on a Light-Up Column. The screens are most commonly used as an effect and a way to display a message to the crowd. We put fun, vivid HD ambient effects on the screens that match whatever music or vibe is going on in the room at the time. We overlay the Bride and Groom’s names and their Instagram Hashtag. Music Video is available Upon Request for No Additional Fee! 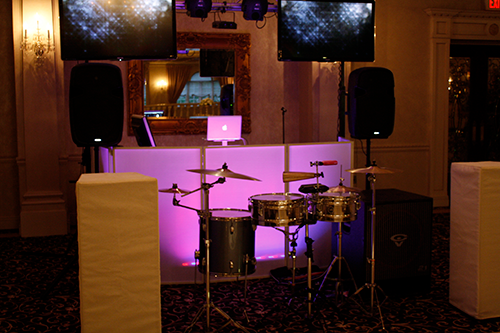 Your Wedding DJ will become your Wedding VJ and mix the best music videos. From oldies to the latest hits, we carry over 10,000 music videos. Please let 1-800-Jam-Music know at least 30 days in advance if you’d like music video.